Put the two C RIBBON pieces around the brake lever sleeves. Wrap the ribbon around one end of the handlebar giving it a complete turn inward and letting it stick out by a few mm. 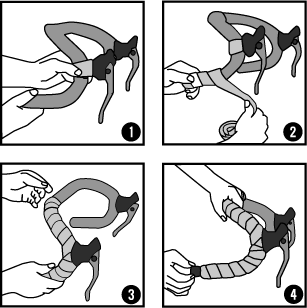 While stretching slightly, continue coiling the ribbon, wrapping it over the ribbon already applied. Cut excess ribbon and affix with adhesive tape. Set the cap in position and repeat the process on the other end of the handlebar.